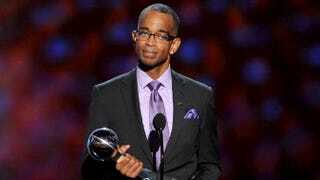 "Stuart Scott's impact can be measured in Sunday’s outpouring of affection for him after news of his death, at 49 from cancer, broke," Sean Gregory wrote Sunday for Time magazine. "It cut across all sports, all silos of American culture, from LeBron James to Tiger Woods to Barack Obama to Nicki Minaj. It can be seen in Hannah Storm, the seasoned television professional who couldn't hold back her tears while eulogizing her colleague on live TV Sunday morning, or Rich Eisen, Scott's straight-man for many years on ESPN's SportsCenter, who cut into the NFL Network's pregame playoff coverage to offer a raw, touching tribute. "Scott's colleague and friend, ESPN anchor Sage Steele, was afraid that Scott, weak from his cancer battle, might fall down the stairs as he walked onto the stage. But he didn't, and Scott nailed it. 'When you die, that does not mean that you lose to cancer. You beat cancer by how you live, why you live, and the manner in which you live,' he said. 'So live. Live. Fight like hell. And when you get too tired to fight, lay down and rest, and let somebody else fight for you.' . . ."
Travis Waldron added for ThinkProgress.org, "In a media world largely devoid of both African-American faces and, especially, African-American vernacular, Scott's iconic catchphrases — 'Boo-[Yah]! ', 'Cool as the other side of the pillow,' and 'Can I get a witness?' chief among them — brought a style that had been absent from sports and media programming straight to ESPN's most-watched program and, by virtue to the living rooms of white and black families alike. Scott's popularity, and the appeal of his brand of style, made him an icon for other aspiring African-American broadcasters who hadn't seen anything like him on TV before. . ."
Steve Wulf wrote for ESPN, "ESPN knew enough to have sportscasters who represented 45 million Americans, not to mention 80 percent of the players in the NBA and 70 percent of those in the NFL. What we didn't know, until Stuart got here, was how important it was to have someone who could relate to them.
" 'He was a trailblazer,' says ESPN anchor Stan Verrett, 'not only because he was black — obviously black — but because of his style, his demeanor, his presentation. He did not shy away from the fact that he was a black man, and that allowed the rest of us who came along to just be ourselves.' "
Wulf added, "Some of his best moments on the air came when he adopted the persona of a preacher: 'Can I get a witness from the congregation?!' And one of his best moments off the air came when a producer suggested he change a reference on his NBA show from Omega Psi Phi, the fraternity of Michael Jordan and Shaquille O'Neal, to something more universal, like Animal House. Wulf also wrote, "But as Stuart's star rose, so did the vitriol of those who resented his color, or his hip-hop style, or his generation. He received a lot of hate mail, most of it anonymous. If the senders did leave a name and address, Stuart would answer and ask them to tell him what the problem really was. . . ."
A 14-minute ESPN video on Stuart, prepared for when the inevitable happened, was being circulated widely. Richard Deitsch wrote Sunday for Sports Illustrated, "The video obit, a beautiful, moving tribute that should be watched and shared, was completed months ago. ESPN feature producers Mike Leber, Miriam Greenfield and Denny Wolfe, the point people for the project, began working on it shortly after Scott's emotional speech at the ESPYs last July 16, when the anchor amplified how difficult his cancer had hit him. The group completed the feature on September 18 and silently hoped the original would stay buried in Leber’s desk forever. . . . Most of the ESPN people I spoke [with] on Sunday believe Scott never knew such a piece existed. . . ."
Wulf added in an early version, "He changed ESPN too. Scott's style wasn't immediately popular with ESPN's audience or even its top brass. According to the [ESPN] obituary, Scott and ESPN received regular hate mail over his 'hip-hop style,' and at times, ESPN officials asked him to consider dialing it back. Scott refused, and over time that unwillingness to relent proved right. "While ESPN has been criticized, sometimes rightfully, for cultivating the personalities of its 'talent,' its embrace of Scott and a style that hadn't been welcome on such big-time programming before helped it reach a demographic — young people in general but particularly black males who rarely see themselves and their culture or style represented in the sports media — that it hadn’t connected with before. . . ."
The National Association of Black Journalists noted that its Sports Task Force honored Scott earlier this year at its national convention in Boston. ESPN coverage of the tribute can be found here.
" 'This is an extraordinary loss for our entire profession,' said NABJ President Bob Butler. 'Very rarely does someone come along who moves the bar for the entire profession.' . . ."
ESPN spokesman Josh Krulewitz said Sunday night that plans for services were incomplete. Jemele Hill in "The Noise Report," Sports Illustrated: The painful reality of cancer is that you know the day will come . . .
Michael Wilbon, Facebook: I didn't think Sunday morning could get any worse . . .
Daniel Wilco, Daily Tar Heel, University of North Carolina at Chapel Hill: Thank you, Stu. Ingrid Ciprian-Matthews, the CBS vice president/news responsible for coordinating all day-to-day news coverage, will be promoted to senior vice president, news administration, CBS News president David Rhodes announced to CBS staffers on Monday. Ciprian-Matthews, who was born in the Dominican Republic, "has been close to our newsgathering process for many years, including as VP of News since 2011," Rhodes said in his memo, Mark Joyella reported for TVNewser. "She will be moving to the front office with me where she will manage principally our people: who is doing what, on and off air — which ultimately is our whole business. Development, recruiting, and retention will run through this office. Standards Executive Director Al Ortiz will report to Ingrid. . . ."
In another move, Steve Capus, a former president of NBC News who is now an executive editor at CBS, "will move to the front row to help coordinate management of our coverage across platforms and broadcasts. Steve remains in the fishbowl when he's producing Evening News. . . ."
Rhodes said of Ciprian-Matthews when she was promoted in 2011: "Ingrid has had a variety of important roles here since joining CBS in 1993 from CNN. She has done a terrific job coordinating our foreign coverage, most recently around the tumultuous events in the Middle East and North Africa. . . ."
[On Tuesday, Sonya McNair, senior vice president for communications, told staffers by email, "In the coming days, I will relocate to the front row of the Broadcast Center, and will focus a bit more on the big-picture initiatives that will drive CBS News in the days ahead. The Daily News in New York, already with an alarmingly low number of African Americans and Hispanics covering the majority-minority city, is losing its last black reporter. Jan Ransom, who came to the News in 2013 from the Philadelphia Daily News, messaged Journal-isms Monday that "I am leaving the News. My last day is Tuesday. I will begin a new job with the Boston Globe next month. I'll be covering the police department focusing on policy and police community relations. I was the only black reporter on staff." However, the News has hired Keldy Ortiz, a Dominican-American reporter at the New Haven (Conn.) Register who speaks fluent Spanish. "I will be starting at the Daily News, covering communities in the five boroughs in New York City. I would be more specific, but I haven't started yet," Ortiz told Journal-isms in a message. The News does have managers of color, including Rob Moore, an African American who is a managing editor. In June, the newspaper laid off Michael Feeney, who covered Harlem and the South Bronx and is president of the New York Association of Black Journalists, and Enid Alvarez, a photographer who said she was the only one in her department who spoke fluent Spanish. That same month, reporter Simone Weichselbaum announced that she was leaving for the start-up Marshall Project covering criminal justice issues, and reporter Jennifer H. Cunningham was laid off. Tanyanika Samuels, who is black and covered the Bronx, was let go as part of layoffs in May. "A grand jury member's lawsuit seeking a court order to speak out about the Michael Brown investigation accuses Prosecuting Attorney Robert McCulloch of publicly misrepresenting the panel's viewpoint after it chose not to indict Officer Darren Wilson," Joel Currier and Robert Patrick reported Monday for the St. Louis Post-Dispatch. "The filing says that the heavily-redacted grand jury documents McCulloch released Nov. 24 'do not fully portray the proceedings before the grand jury.' McCulloch spoke publicly that night about the grand jury's decision against charging Wilson. "Ferguson erupted in protests, including arsons that burned about a score of buildings within hours. "A spokesman for McCulloch declined comment on the lawsuit Monday. . . ."
NYPD Exhibits "Puffed Grandeur and Bombast"
"On Sunday, a relatively large group of New York police officers, sworn to protect and serve the public,turned their back on the public's elected executive, Mayor Bill de Blasio:" Ta-Nehisi Coates wrote Monday for the Atlantic. "The show of disrespect came outside the funeral home where Officer Wenjian Liu was remembered as an incarnation of the American dream: a man who had immigrated at age 12 and devoted himself to helping others in his adopted country. The gesture, among officers watching the mayor's speech on a screen, added to tensions between the mayor and rank-and-file police even as he sought to quiet them. "It's not clear that Bratton could (or should) do much of anything to stop his officers from protesting. But whatever Bratton's sense of honor and decency, it clearly isn't shared by the officers working under him, and it's unlikely that his appeal swayed anyone. "Those who are demoralized by these protests would do well to read James Fallows's cover story on the American military this month. The same cloak of puffed grandeur and bombast that surrounds our army can be detected in our police. Jim is describing a society that has taken its hands off the wheel. Give us safety now (real or imagined), goes the agreement, and we won't ask about what comes later. Until some critical mass of Americans decides that police cannot, all at once, wield the lethal power of gods and the meager responsibilities of mortals, change is unlikely. . . ."
"Racism was overt and ubiquitous," Terrell Jermaine Starr, a senior editor at AlterNet who specializes in African diasporas in Europe, wrote Friday for the Washington Post. The Brooklyn, N.Y., resident was describing his time in Ukraine and Russia while on a Fulbright scholarship. "One of my most blatant encounters came when I was headed to Russian class," Starr's piece continued. "I was purchasing a token at the Central Train Stop, when I spotted a young cop glaring at me. As a black American, I'm all too familiar with the look police officers give just before stopping you, and immediately recognized the gaze even in this foreign country. "Another cop soon joined him in interrogating me, demanding to know the real reason I was in Ukraine. They insisted I was posing as a student to mask my real intent: smuggling drugs. Even after showing them my Fulbright documents, they continued to harass me. Only after nearly 30 minutes of questioning did they realize I was clean and release me. "As bad as the experience sounds, I appreciated the young [cop's] forwardness. He made it clear that his stop was motivated by race and nothing more. In New York City, where I now live, the NYPD immediately rejects any suggestion that racism can motivate officers' behavior, even subconsciously. . . . "
Starr told Journal-isms by telephone that white journalists covering Russia and Ukraine fail to take note of the immigrant population, saying that group offers a different perspective on Ukraine's complex but growing nationalism. But "you don't get those stories because just as many white reporters are wary of discussing racism in America, they're like that when they go overseas. They are thinking about Putin," Starr said. Starr said he was stopped more than 30 times by police in his year and a half there. Starr also said Ukraine has a substantial biracial population that is underreported. He concluded in the Post, "While many of my African-American friends cringe at my stories about being black in Eastern Europe, I reflect on my time there fondly. That's not to say that race relations in Europe are better than in the United States. As far as I am concerned, they are just as bad, if not worse, on average. "Indeed, when I experienced racism in Eastern Europe, it was frequently harsh, even though I had the distinct advantage of being an American. Africans were treated far worse. But what I did enjoy about Eastern Europe, especially Ukraine, was that I was able to make many breakthroughs on race with locals that I have yet to experience in the United States. Instead of entrenching in their racial ignorance, Ukrainians were honest about their naiveté and open to learning about a different culture. In the midst of our own battles in the United States, we could afford to take a similar approach to achieve better racial understanding." New York Post Goes After "Shakedown Al"
The New York Post devoted its front page Sunday to the Rev. Al Sharpton. "Want to influence a casino bid? Polish your corporate image? Not be labeled a racist? Then you need to pay Al Sharpton," the story by Isabel Vincent and Melissa Klein said. "For more than a decade, corporations have shelled out thousands of dollars in donations and consulting fees to Sharpton's National Action Network. What they get in return is the reverend' supposed sway in the black community or, more often, his silence. . . "
Sharpton replied on the National Action Network website: "What is interesting is that the exact same story was done by the exact same New York Post writer on June 15, 2008 and was widely discredited. . . ."
Meanwhile, a story by Luke Mullins in the January issue of Washingtonian magazine suggests that creating Sharpton's MSNBC show "PoliticsNation" was part of an effort to win federal approval for Comcast's takeover of NBC. "In 2009 and 2010, Comcast gave $155,000 to an organization founded by the Reverend Al Sharpton, who ended up endorsing the merger," Mullins wrote. "The campaign paid off. In January 2011, Washington approved the deal. . . ."
"Cairo-based CNN correspondent Reza Sayah has left the network, TVNewser has learned," Chris Ariens reported Saturday for TVNewser. "Sayah, who has been with CNN since 2008, was named Cairo correspondent in November 2012. Before that, he covered South Asia, based in Islamabad. Sayah joined CNN from WXYZ-TV in Detroit. . . ."
"He has been called 'a giant in New York politics,' 'an oratorical magician who electrified liberals,' 'intelligent and compelling,' and 'Hamlet on the Hudson.' But to Indian country, former New York Gov. Mario Cuomo, who passed into the spirit world on the first day of the New Year, was 'a steadfast ally' and 'a truly great man,' . . . "Gale Courey Toensing wrote Monday for Indian Country Today Media Network. Lonnae O'Neal, a 19-year reporter for the Washington Post who wrote under the byline of Lonnae O'Neal Parker, debuted Monday as a twice-weekly columnist for the Post's Style section. "I'm feeling like a newsroom therapist," she wrote. "Message: I care. I'm here to listen. Tell me all your little business. It might end up in a column, but at least you'll be heard. And don't worry. I’ll protect your identity, even if the Justice Department subpoenas me. Actually, I won't. I’ll sing like Mahalia Jackson. . . ."
Aaron Maybin, a senior journalism major at Marquette University, will be awarded its $10,000 Ed Bradley scholarship, the Radio Television Digital News Foundation announced Monday. "The Wisconsin native is currently an associate producer at WISN-TV in Milwaukee, where he writes for newscasts, pitches story ideas and shadows reporters. During the summer of 2014, Maybin investigated inner-city gun violence in Flint, Michigan and the deep-rooted hunting culture in Minnesota for the Carnegie-Knight News21 initiative," the foundation said. "Northwest Arkansas Newspapers, LLC announced Monday that it is consolidating its five northwest Arkansas daily newspapers into a single regional newspaper, the Northwest Arkansas Democrat-Gazette," the company said. "Northwest Arkansas Newspapers, LLC is jointly owned by WEHCO Media, Inc. and Stephens Media. Northwest Arkansas Newspapers owns and operates the Benton County Daily Record, Rogers Morning News, Springdale Morning News and Northwest Arkansas Times and the Arkansas Democrat-Gazette, Northwest Edition. With the consolidation, the individual daily newspaper nameplates and content will continue to be published as the 'B' section of the Northwest Arkansas Democrat-Gazette. . . ."
Vulture.com apologized Monday for a piece by editor Carl Swanson about Detroit artists Friday that featured only whites. "As many commenters have pointed out, this story, which focuses on artists who have chosen to make Detroit their home, missed an opportunity to highlight artists of color. The list does not fully reflect the diversity of voices and experiences in the city, for which we apologize," a note read.